Virginia Ryan has been an educator for over 30 years. She was the Adult Faith Education and Pastoral Formation Coordinator at The Broken Bay Institute where she was the national co-ordinator for the ACBC eConferences on Paul, Luke, Mary and Jesus the Christ. For three years Virginia edited and wrote for a monthly e-newsletter each month, Mission and Spirituality News which has an audience of about 17,000 subscribers nationally. Virginia is currently a member of the Broken Bay Diocese Catholic School Office Mission Team where she designs and delivers faith formation opportunities for school leadership teams, whole school staff and parents. This entry was posted in Videos on May 6, 2012 by Mark Wei. This entry was posted in Videos on May 3, 2012 by Mark Wei. Emma Rossi is a Media Executive at the Australian Communications and Media Authority (ACMA) She has previously worked as a Reporter/Newsreader at Seven Network Limited and at the Nine Network as a Reporter/Newsreader. She was chair of the Board of Directors for the Sisters of St Joseph Peruvian Project for four years. Bishop David Walker has been chief pastor to the people of the Diocese of Broken Bay for the past 15 years. His deep love and interest in spirituality forms the backbone to his commitment to promote a truly Australian spirituality, and the fostering of theological and spiritual education. Bishop David’s ongoing support for furthering serious theological study and adult faith formation to the wider Catholic community has led to the development and founding of the Catholic Correspondence Centre, The Centre for Christian Spirituality and The Broken Bay Institute. He is a prominent speaker and has published extensively on faith renewal, spirituality, mysticism, formation of clergy and Church leadership. As a member of the Australian Catholic Bishops Conference Commission for Mission and Faith Formation, he has undertaken evangelisation of the Scriptures. His promotion of lectio divina through new media has taken the Word of God in to the hearts and homes of people throughout Australia and the world. Julie Posetti is a journalist and journalism academic from Canberra, who has worked with the flagship ABC current affairs programs AM, PM and the World Today. In 1997, she was posted to the Canberra Press Gallery as a political correspondent for these programs. Her reporting focus has been on social justice issues including Aboriginal affairs and ethnic communities. While she still calls herself a journalist, she moved into academia in 2003 and now teaches radio and television journalism at the University of Canberra. She is currently working on a PhD on the Twitterisation of Journalism while continuing research into multicultural journalism, talk radio and public broadcasting. Shamrocks – a group of people with disability who inspire! This entry was posted in Videos on April 24, 2012 by Mark Wei. The Bishops of Australia have invited the whole Church to a Year of Grace which will commence at Pentecost, 2012. This short video shows the Bishops breaking open the theme “Starting afresh in Christ”. This entry was posted in Videos on March 23, 2012 by Mark Wei. Live the Faith, Receive the Grace – Bishop Peter Ingham’s Lenten Pastoral Message 2012 from Daniel Hopper on Vimeo. Bishop Peter Ingham breaks open the Gospel for Sunday 19 February 2012 (Mark 2:1-12) where four people carrying a paralysed person, creatively and with determination, removed the roof and lowered their friend inside a house overcrowded with people who were listening to Jesus preach. Like the stretcher bearers in the Gospel, Bishop Peter challenges us this Lent to live our Faith and receive the Grace that comes from God. This entry was posted in Videos on February 15, 2012 by Mark Wei. About 1,500 Sisters of Mercy, their friends, families and ministry colleagues gathered at St Mary’s Cathedral in Sydney on Sunday, December 18, for the foundation Eucharist of the newly established Institute of Sisters of Mercy of Australia and Papua New Guinea (PNG). This entry was posted in Press Releases, Videos and tagged Archbishop Wilson, Cardinal Pell, catholic bishops, Church, Papua New Guinea, Religious, Sisters of Mercy, Sr Berneice Loch RSM, St Mary's Cathedral on December 20, 2011 by Mark Wei. 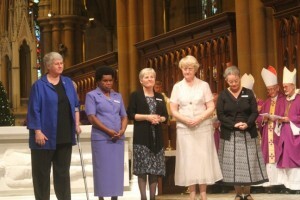 On the 12th of December, 2011, the Sisters of Mercy Australia and Papua New Guinea formed one joined Congregation, which will be known as the Institute of the Sisters of Mercy of Australia and Papua New Guinea. The following clip is of highlights of the Mass which was celebrated at St Mary’s Cathedral by Cardinal George Pell, Archbishop Guiseppe Lazzarotto and Archbishop Philip Wilson, as well as Bishops and Priests from Australia and Papua New Guinea. This entry was posted in Videos and tagged Archbishop Guiseppe Lazzarotto, Archbishop Wilson, Cardinal Pell, catholic bishops, Christ, Church, Jesus Christ, Religious, Sisters of Mercy, St Mary's Cathedral on December 20, 2011 by Mark Wei. This entry was posted in Uncategorized, Videos on December 8, 2011 by Mark Wei.